Background: Management of combination fractures of the atlas and axis varies from nonoperative immobilization to selective early surgical intervention. In this study, we present our experience in managing these injuries. Materials and Methods: Electronic databases from two level 1 trauma centers were queried to identify all patients diagnosed with C1-C2 combination fractures from 2009 to present. Patient demographics, fracture characteristics, treatment modality, complications, Frankel scores, and fusion status were collected. Patients were separated into operative and nonoperative cohorts, and comparisons were made between the two groups. Results: Forty-eight patients were included, of which 19 received operative management and 29 were treated nonoperatively. The mean age was 76.1 and 75.3 years, respectively (P = 0.877). Frankel grade distribution was similar on presentation in both groups, with most being neurologically intact. C1 fractures of both the anterior and posterior arch were present in 41.2% patients undergoing fusions compared to 27.6% of patients treated nonoperatively. No significant differences in comorbidities, neurologic deficits, or radiographic measurements were observed across the two groups. Conclusions: This study demonstrates the variety of treatment strategies used for the management of combined C1-C2 fractures. Patients managed operatively tend to have both anterior and posterior C1 arch fractures, while patients managed nonoperatively tend to have either anterior or posterior arch fractures. In general, treatments should be tailored to patients' needs depending on the stability of the fractures, neurological state, and medical comorbidities. Despite being a relatively common occurrence with an associated increase in neurologic impairment, the management strategy for fractures of the C1-C2 complex remains a subject of controversy. Conservative approaches have included hard and soft collars and external fixation through halo vest, with reports of approximately three-fourths of patients being treated successfully by external orthosis., Meanwhile, early surgical stabilization has been advocated for, when at risk for increased morbidity, particularly in those with a high risk for nonunion., The type of injury, the state of atlantoaxial stability, and the surgeon's expertise are all determining factors in the management selection. In this report, 48 cases are retrospectively analyzed to gain insight into the treatment selection after a sustained combination fracture, as well as the outcomes associated. From January 2009 to January 2015, patients admitted at two level 1 trauma centers were identified who had suffered combination fractures to the atlas and axis, and independent chart review was completed. Clinical data extracted included patient demographics, smoking and medical history, comorbidities, mechanism of injury, fracture characteristics, treatment course, length of stay, complications, readmissions, follow-up, and fusion status. Atlas fracture characteristics were recorded and included those of the anterior arch, posterior arch, or both (Jefferson). Axis fracture characteristics were recorded and included those of the odontoid process (Type I, II, or III), bilateral pars interarticularis (Hangman's fracture), or vertebral body. Patients were grouped into operative or nonoperative cohorts for comparative purposes. Nonoperative management included halo immobilization and semirigid immobilization with Miami or Aspen collar. The presence of neurological deficits pre- or post-treatment was noted, and Frankel grades were assigned for initial presentation, posttreatment, and at last follow-up. Measurements of the atlantodental interval (ADI), occiput-C2 angle, C2-C3 angle, and C2-C7 angulation were made on available radiographs. Fusion status was followed by dynamic imaging and achievement ultimately determined on computed tomographic imaging by an independent radiologist's review. Statistical analyses were performed using SPSS (version 22, IBM Corp., Armonk NY, USA). Continuous variables were analyzed using two-sided Student's t tests. Descriptive statistics and categorical variables were assessed with Chi-squared tests. P < 0.05 was considered statistically significant. Forty-eight patients sustaining concurrent fractures to the atlas and axis were included for analysis. Overall, mean age was 75.6 years, with 16 males and 32 females (33.3% vs. 66.7%, respectively). The most frequent comorbidities included hypertension (50%), hypothyroidism (20.8%), and type 2 diabetes mellitus (10.4%). Smoking status was available for all patients, with 10/48 patients disclosing an active or positive smoking history (20.8%) and 38/48 (79.2%) never smokers. Common mechanisms of injury included mechanical fall (85.4%) and motor vehicle accident (10.4%). Twenty-nine patients (60.4%) were treated nonoperatively, and nineteen patients received surgical intervention (39.6%) [Table 1]. For patients managed operatively, neurologic deficits were noted on initial presentation for 3/19 (15.8%) compared to 3/29 (10.3%) for those managed nonoperatively (P = 0.58; Chi-square test). Pretreatment Frankel grades were additionally assigned for the two groups [Table 2]. Of those patients receiving operative or nonoperative management, 4/19 and 6/29 were current or former smokers, respectively (21.1% vs. 20.7%). Preexisting conditions in the operative cohort included 9/19 (47.4%) patients with hypertension, 3/19 (15.8%) with hypothyroidism, and 1/19 (5.3%) with osteoporosis. Preexisting conditions in the nonoperative cohort included 15/29 (51.7%) patients with hypertension, 7/29 (24.1%) with hypothyroidism, 5/29 (17.2%) with coronary artery disease (CAD), 4/29 (13.8%) with hyperlipidemia, 4/29 (13.8%) with type 2 diabetes mellitus, and 3/29 (10.3%) with osteoporosis. No patients with CAD were seen in the operative group. Overall, C1 fracture characteristics included 15/48 (31.3%) with the anterior arch inflicted, 17/48 (35.4%) with the posterior arch inflicted, and 16/48 (33.3%) with Jefferson fractures (anterior and posterior arch fractures). In the operative versus nonoperative cohorts, 8/19 and 8/29 had C1 injuries characterized as Jefferson fractures, respectively (42.1% vs. 27.6%, P= 0.30; Chi-square test) [Figure 1]a. No statistical significance was observed when comparing either C1 fractures of only the anterior arch or fractures of only the posterior arch across the two management groups. C2 fracture characteristics included Type II odontoid for 35/48 (72.9%), Type III odontoid for 4/48 (8.3%), vertebral body for 4/48 (8.3%), Hangman's fracture for 2/48 (4.2%), and lateral mass for 1/48 (2.1%) [Figure 1]b. No statistical significance was observed when comparing C2 fracture characteristics across the two management groups. The most frequently observed combination of C1 and C2 fractures was C2 Type II odontoid, occurring in 15/19 (78.9%) of the operative cohort and 19/29 (65.5%) of the nonoperative cohort. Of the patients receiving surgical intervention, 10/19 (52.6%) had a posterior spinal fusion (PSF) of C1-C2 with instrumentation. A total of 8/19 (42.1%) patients had an occipitocervical fusion (OCF). A total of 1/19 patients (5.3%) had anterior odontoid screw fixation. Mean pretreatment ADI for the operative and nonoperative cohorts was 1.94 mm and 1.78, respectively (P = 0.58). Mean pretreatment C2-C3 angulation (degrees) was 7.81 and 6.06, respectively (P = 0.28). Mean pretreatment C2-C7 angulation (degrees) was 50.82 and 42.34, respectively (P = 0.27). Mean occiput-C2 (O-C2) angulation (degrees) was 32.67 and 30.40, respectively (P = 0.53). 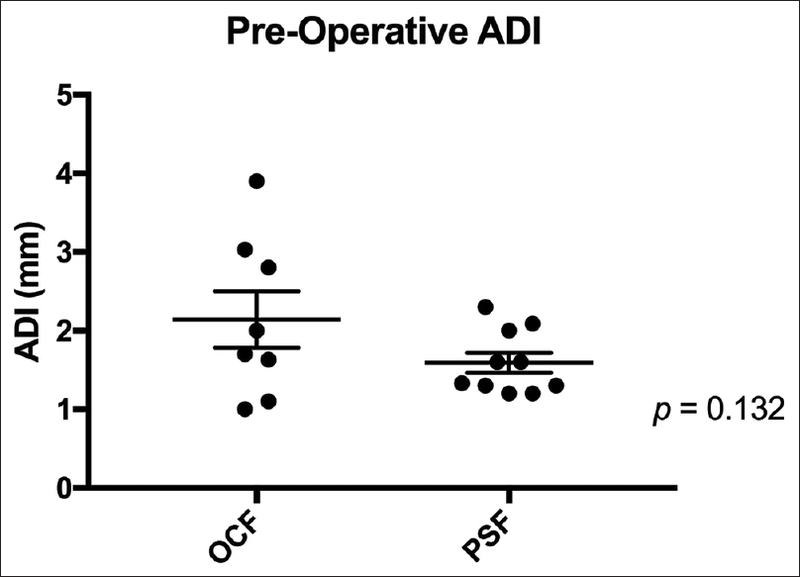 Patients receiving OCF and C1-C2 PSF had a mean preoperative ADI of 2.15 and 1.59, respectively (P = 0.132), [Figure 2]. Postoperatively, mean ADI for the cohort was 1.63 mm (Δ = −0.31 mm; P= 0.28). C2-C7 angulation (degrees) was 41.17 (Δ = −9.65; P= 0.18). Mean O-C2 angulation (degrees) for patients receiving OCF and C1-C2 PSF was 32.2 and 32.6, respectively (P = 0.96). Patients receiving OCF and C1-C2 PSF had a mean difference in pre- to post-operative ADI of −0.44 mm and −0.14 mm, respectively. The two groups had a mean difference in pre- to post-operative C2-C7 (degrees) of −8.46 and −11.9, respectively. Statistical significance was not reached in comparing the measurements for OCF and C1-C2 PSF. Of patients receiving operative management, 3/19 developed surgical complications: intraoperative pneumothorax (n = 1), left vertebral artery injury (n = 1), and postoperative aspiration pneumonia (n = 1). No complications were observed for the nonoperative group. The mean hospitalization was significantly less in the nonoperative group 7.2 days versus 13.5 days in the operative group (P < 0.0007). The mean follow-up of the cohort was 305.2 days. The mean follow-up in the operative and nonoperative cohorts was 261.4 days and 342.1 days, respectively. Overall, imaging was available for assessment of fusion achievement in 30/48 cases, with 22/30 (73.3%) confirmative of fusion. In the operative and nonoperative cohorts, 9/12 (75%) and 13/18 (72.2%) had achieved fusion, respectively (P = 0.87; Chi-square test). Combination fractures of the atlas and axis are a relatively frequent subset of cervical spine injuries. It has previously been reported that the incidence of these fractures is age dependent, most often presenting in the elderly and likely associated with the greater prevalence of osteoporosis in this age group. In addition, studies have noted that falls are the most likely mechanism of these injuries, particularly in the elderly., Our study corroborates these findings, with 75.6 years as the mean age of patients with combined atlantoaxial fractures. Moreover, while only 8.3% of these patients presented with a diagnosed history of osteoporosis, 85.4% of the injuries were secondary to a fall, suggesting that the elderly spine remained a predisposing risk factor. Furthermore, in agreement with previous studies, the vast majority of the patients reported here had a C2 injury that consisted of a Type II odontoid fracture.,, Injuries of the atlas were evenly distributed between the anterior arch, posterior arch, or Jefferson fractures. The variety of treatment strategies utilized for the management of combined atlantoaxial fractures is a subject of numerous reports.,,, On the conservative side, rigid external immobilization with halo devices has been popular, and treatment success has also been reported with the use of cervical collars. However, early surgical intervention has also been advocated for, given the greater risk for neurological morbidity and biomechanical instability with these combined injuries. Ultimately, it has been recommended that management decisions be made based on the patient's clinical presentation and fracture characteristics. As one of the largest case series to date for combination fractures to the atlas and axis, our study serves as a demonstrative example of the variability in management, with 60.4% treated conservatively and 39.6% receiving early surgical intervention. We found that no preexisting conditions were significantly different between the two groups; however, the two patients with noted cardiovascular risk were selected for nonoperative management. The C1 Type II fracture combination was most common in both management groups, and of note, while not reaching statistical significance, patients managed operatively had a greater incidence of Jefferson fractures (42.6%) than those managed nonoperatively (27.6%). Most of these patients are neurologically normal on presentation. Pretreatment mean values for the measurements of ADI, C2-C3 angle, C2-C7 angle, and O-C2 angle were similar between the two treatment groups. Overall, outcome measures for the operative and nonoperative cohorts were comparable. Both groups had similar Frankel grade distribution on final follow-up with most being neurologically normal. While no treatment complications were observed for the nonoperative group, three patients managed surgically did experience operative or postoperative complications. Finally, for those patients with imaging available for assessment of fusion status, no difference was observed in the rate of C1-C2 union between the two groups. Within the operative arm of this study, the majority of patients were stabilized by either OCF or C1-C2 PSF., Mean values for the O-C2 angle – a documented marker for risk of postoperative dyspnea and dysphagia (d/d) – between these two groups were nearly equal, suggesting that patients undergoing OCF for their atlantoaxial fractures were not at higher risk for d/d. In addition, there were no reports of patients experiencing postoperative d/d. [Figure 2] demonstrates a comparatively greater range of pretreatment ADI for those who received OCF compared to C1-C2 PSF. This supports the common practice that more unstable C1-C2 injuries may necessitate early fixation with greater stabilization. Despite serving as one of the largest studies on the management of combined fractures to the atlas and axis, our report remains limited by small sample sizes given the overall rarity of this entity. In addition, loss to follow-up led to a smaller assessment of fusion status and long-term outcomes. Further prospective analyses of the outcome differences between the operative and nonoperative treatment strategies are necessary to better characterize the best management for a given setting. Combination fractures of the atlas and the axis are prevalent in the elderly population. The management of combined atlas-axis fractures varies from nonoperative rigid collar bracing to operative stabilization including atlantoaxial and OCFs. The decision toward surgical intervention is usually determined by clinical assessment of the stability of these combined fractures, as well as the medical condition of the patient. Patients with associated anterior and posterior arch fractures of atlas fractures tend to undergo operative stabilization. Dickman CA, Hadley MN, Browner C, Sonntag VK. Neurosurgical management of acute atlas-axis combination fractures. A review of 25 cases. J Neurosurg 1989;70:45-9. Apostolides PJ, Theodore N, Karahalios DG, Sonntag VK. Triple anterior screw fixation of an acute combination atlas-axis fracture. Case report. J Neurosurg 1997;87:96-9. Greene KA, Dickman CA, Marciano FF, Drabier JB, Hadley MN, Sonntag VK. Acute axis fractures. Analysis of management and outcome in 340 consecutive cases. Spine (Phila Pa 1976) 1997;22:1843-52. Fujimura Y, Nishi Y, Chiba K, Kobayashi K. Prognosis of neurological deficits associated with upper cervical spine injuries. Paraplegia 1995;33:195-202. Daentzer D, Flörkemeier T. Conservative treatment of upper cervical spine injuries with the halo vest: An appropriate option for all patients independent of their age? J Neurosurg Spine 2009;10:543-50. Dickman CA. Treatment of atlas fractures. In: Principles of Spinal Surgery. New York: McGraw-Hill; 1996. p. 855-69. Wu AM, Wang XY, Chi YL, Xu HZ, Weng W, Huang QS, et al. Management of acute combination atlas-axis fractures with percutaneous triple anterior screw fixation in elderly patients. Orthop Traumatol Surg Res 2012;98:894-9. Guiot B, Fessler RG. Complex atlantoaxial fractures. J Neurosurg 1999;91 2 Suppl:139-43. Spivak JM, Weiss MA, Cotler JM, Call M. Cervical spine injuries in patients 65 and older. Spine (Phila Pa 1976) 1994;19:2302-6. Weller SJ, Malek AM, Rossitch E Jr. Cervical spine fractures in the elderly. Surg Neurol 1997;47:274-80. Esses S, Langer F, Gross A. Fracture of the atlas associated with fracture of the odontoid process. Injury 1981;12:310-2. Izeki M, Neo M, Takemoto M, Fujibayashi S, Ito H, Nagai K, et al. The O-C2 angle established at occipito-cervical fusion dictates the patient's destiny in terms of postoperative dyspnea and/or dysphagia. Eur Spine J 2014;23:328-36.